It’s appetizer day! I thought about making dips, buffalo dip, french onion dip, some kind of fruit dip and then it hit me. Why not make something fresh and bit sophisticated that everyone can enjoy. Antipasto bites. You get the freshness of the veggies and herbs, the creaminess from the fresh mozzarella, with a hint of smokey flavor from the fire roasted pepper and artichokes. A few months ago I saw in a magazine where they placed slices of salami in the oven to create “chips” for dip. This got me to thinking what if I placed them in the oven a in muffin tin or ramekins? Equip with a pound of salami and all of the small round baking containers I could find I started testing baking times, temps and oven proof containers to find the perfect salami cup. Out of all the yummy things I’ve made this week this was by far the most challenging. Lucky for you I have taken all of the guess-work out of the process. 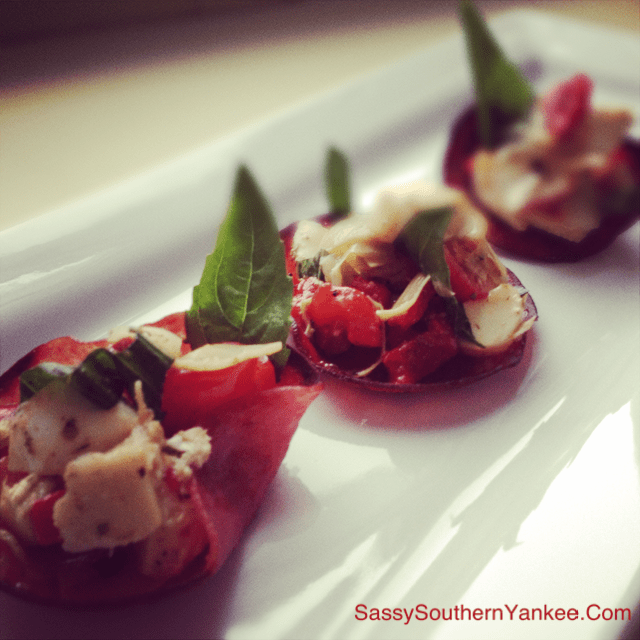 Lets get started on these super easy and yummy antipasto bites! Pre-Heat the oven to 400*. 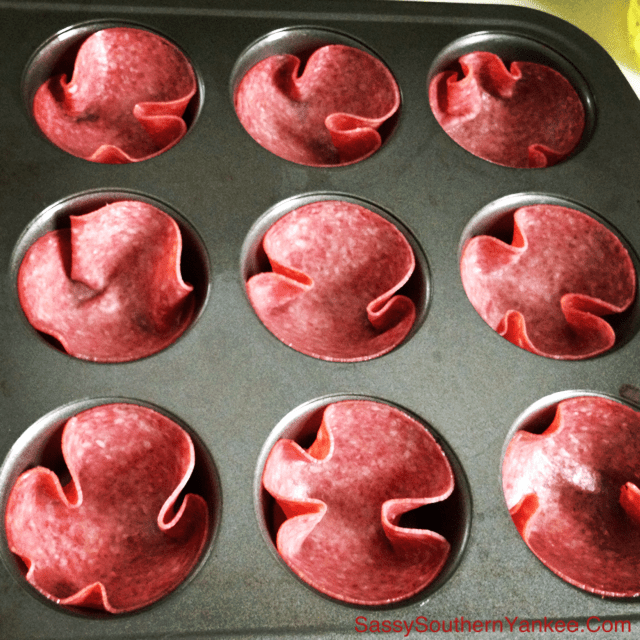 In a cupcake pan place 12 slices of salami into the cups of the pans. Bake for 7-10 min depending on the thickness of the salami and your ovens temperature. Keep an eye on these little guys as they tend to turn from looking wonderful and golden to being burnt to a crisp. Once the salami cups are cooked remove them from the cupcake tin and place them on a piece of paper towel on a plate to help cool and drain any excess oil. 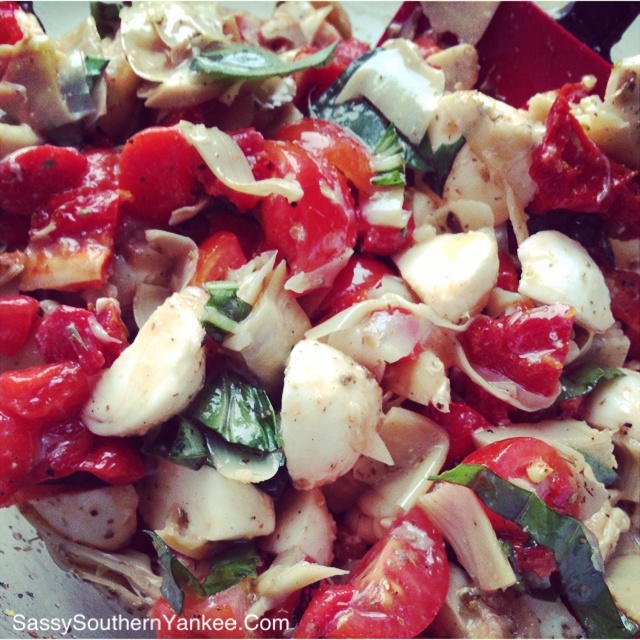 Next chop up the Artichokes, Mozzarella, tomatoes, basil, and roasted red pepper. Pop everything into a bowl. Add the dried oregano, red pepper flakes, and olive oil. Stir mixture combining throughly. Salt and pepper to taste. To assemble the antipasto bites take your salami cups and fill them with your salad mixture. Set on a plate then drizzle with your basaltic vinegar reduction. You can make these the antipasto bites ahead of time just wait to assemble them until you are ready to serve. The filling tastes amazing once it has a bit of time to perk up and pull all those wonderful flavors together. 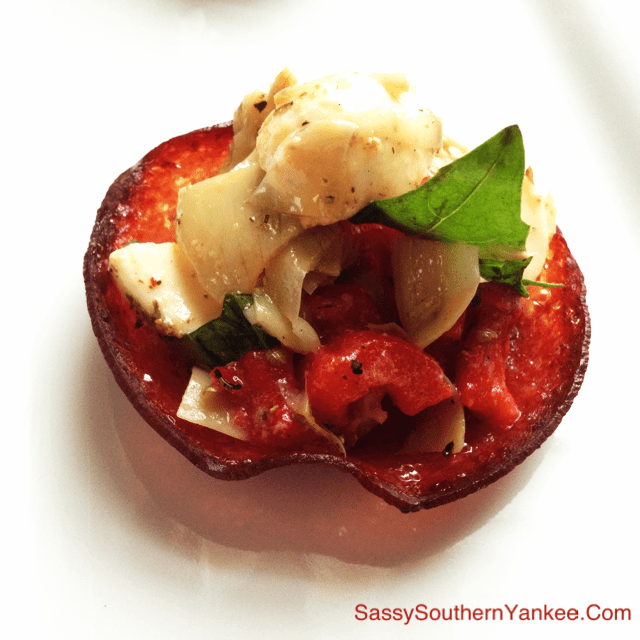 This entry was posted in Side Dish and tagged Antipasto Bites, appetizer, artichokes, balsamic reduction, basil, Gluten Free, mozzarella, olive oil, oregano, roasted red pepper, simple appetizers, Super Bowl.